Whether you’re sprucing up your beach home or turning your primary residence into an ocean-inspired oasis, you can’t forget your front door. This is the first thing that visitors see when they approach your home, and a nautical door knocker is guaranteed to brighten their faces with a smile. It should also make you smile as you look at the door and know that you’re home. Whether you love creatures of the sea or miss the sand between your toes, these nautical door knockers will help you bring the beach home. Anchors symbolize strength through stormy weather. They’re used to hold ships in one place when out at sea, and they’re strong enough to keep even large vessels stable and secure through the most vicious storms. 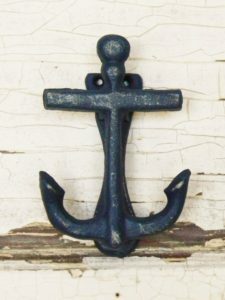 Whether you want to bring that sense of strength and stability to your home or you just like anchors because they have an interesting shape that fits your nautical theme, you can’t go wrong with an anchor door knocker. This knocker is handcrafted from cast iron, and you can choose your color for the paint and finish. You can even ask for a distressed look if that fits your style. If you prefer something shiny, ask for a gloss or satin finish instead of the standard matte finish. 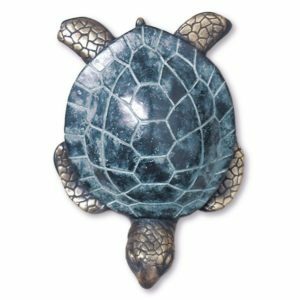 Give your door a splash of color with this brass turtle door knocker. The head and legs maintain the natural shine of the brass while the shell is painted in an interesting pattern with navy and aqua blue. Your guests will love grasping the shell or lifting the head to give your door a knock, and how can you resist running your fingers along the grooves of this turtle’s back? From the closed eyes to the tip of the tail peeking out from the edge of the shell, the fine details make this turtle a work of art. Weighing just over six pounds, this is also a sturdy knocker that should hold up to the weather for many years. Whether you go for the distressed look or ask the seller to cover your seahorse in glitter, door knockers don’t get much cuter than this one. This is a handcrafted item made from recycled materials, and you can select from more than 50 color options. 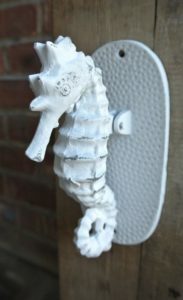 The seahorse is colored, distressed, glittered and finished according to your preferences, and it comes mounted on a decorative plaque that easily screws into your door from the outside. Make sure to take in the small details that give this door knocker an authentic appearance, especially the long rounded tail and curve of the body. When friends come for a visit or you slip into your home after a long day on the beach, there’s nothing better than slicing open a juicy pineapple. This tropical fruit is best enjoyed on the edge of your glass while you watch the waves from the beach, but it’s just as good on a platter or hanging on your front door. When you can’t raise your glass and toast to good friends, you can at least let them raise your pineapple and send you a friendly knock. This is a vintage door knocker, so you’re going back to the 80s with this beauty. It’s perfect for waterside homes, vacation homes or the residence of anyone dreaming of a secluded tropical getaway. There are few things more enjoyable than an afternoon searching for seashells along the beach. With the tide splashing up to your feet and the sun kissing your forehead, you get a rush of excitement when you see a beautiful shell poking up from its hiding place. Seashells are collected, placed in aquariums and cherished for their symbolism of fertility and love. 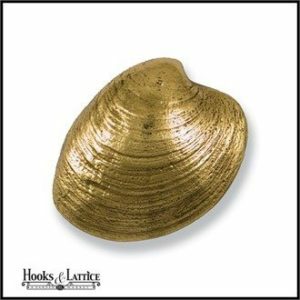 They also make elegant door knockers, especially if you select this one from Hooks & Lattice. 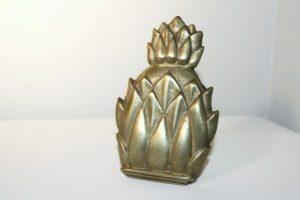 Each shell is crafted by hand from brass and then finished with a shine of bronze. The craftsmen pay attention to the fine details, creating the delicate lines that swirl along the surface of real seashells collected near the ocean. The final product will easily blend with most door colors and styles, and it will give the entrance of your home a touch of elegance. In the Chinese culture, crabs symbolize prosperity and great success, and who doesn’t want to bring a bit of that to their home? This door knocker may also make you think of cocktails at your favorite seaside restaurant, so it’s the perfect addition to your home away from home or your nautical-themed primary residence. With a curved body and claws reaching out to the sides, your guests will have fun grabbing your crab and dropping it down for a solid knock. 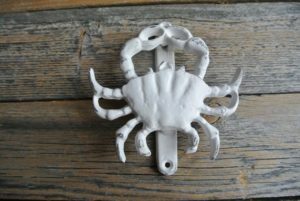 You get to choose from more than 30 colors to customize this handcrafted knocker, so your crab will feel right at home guarding the entrance to your home. Do you like to keep your door accents simple? 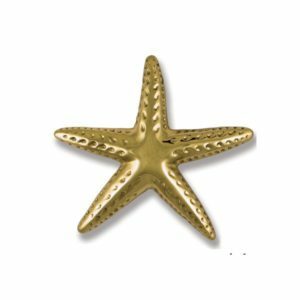 This starfish door knocker is available in nickel silver or brass and is designed with the authentic shape of a starfish. The fine details include small indents along all five of the arms, and the lightweight design makes it easy for guests of all ages and sizes to send out a knock. Who says the best things in life are complicated? This is a handcrafted door knocker from one of the leading designers in the field, and it even comes with the authentic signature of Michael Healy. If you prefer all things designer and would settle for nothing less when it comes to your front door, this is an elegant and fun way to add a touch of the beach to your home. 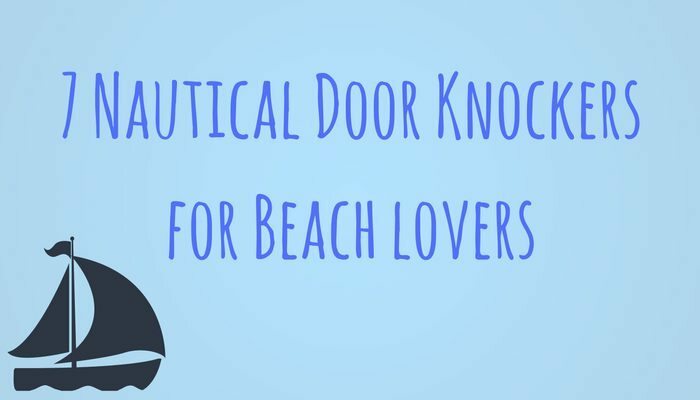 With your nautical knocker in place, you’ll easily think of other fun accents to bring the peace and serenity of the beach into your home. Have fun shopping for unique décor that builds on your nautical theme.